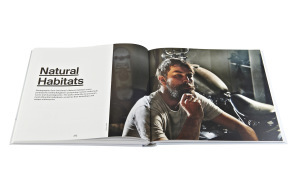 A book for those that share the passion for custom motorcycles. Edited by Chris Hunter and Robert Klanten with texts by Paul d’Orleans, David Edwards and Gary Inman. The motorcycle is back! But not as you know it – ever since the motorcycle was born it has been the subject of change and modification… very, very few motorcycles have survived exactly as they were manufactured or how they left the showroom floor. From the early days there have been trends; of the ‘Bobber’, the ‘Chopper’ and the ‘Cafe Racer’ – these creations engineered in garages and sheds across the World and now from the subculture of ‘Built not Bought’ there is the current community of bikers who are discovering the love of the bike that only they want – an expression of your personality. If others like it too then all the better but your bike is modified exactly how you want it… well, until you get inspired to modify it again and many motorcycle ‘projects’ are ongoing. The Ride looks at the bikes but refreshingly also looks at the people who are creating these custom motorcycles – and these motorcycles are far from amateur spannered and ‘that should hold’ welding – these are true works of engineering art from builders including Walt Siegl, Deus, Shinya Kimura, Ian Barry and Uwe Ehinger amongst others who truly are craftsmen. We’ve seen many motorcycle books but this one is a ‘must have’ – The book is an art form in it’s own right with superb photography and great design and typography and is well worth the investment as you’ll keep going back to it even if just to have another look at the bikes.